Measurements: 2.76 x 4.6 inches, or 70 x 117 mm. Back of card: A burnished golden frame set inside black edging (as on the front). Inside, a blue circle & at the center, the Sun, as seen on the Sun card, above. Top & bottom, fancy Fleur de Lys. May be inverted, but does not contrast all that well with the front of the cards. Book included: Yes, 5.17 x 7.6 inches, or 132 x 194 mm, 223 pages. Illustrated, with small B&W images the cards. Comments: This is Ciro Marcheetti's popular Gilded Tarot, with new packaging, an excellent new book by Josephine Ellershaw, and an outstanding price. Ellershaw has by far the best grasp of the court cards that I have ever read, and a wonderful grasp of tarot overall. King of Swords, she says, is a cop. King of Pentacles works hard. The King of Cups is a doctor or pastor. The King of Wands is an entrepreneur. I know this is what so many other writers have implied, but Ellershaw cuts to the quick, with these & all the other cards in the deck. Notably there are no inverted delineations. 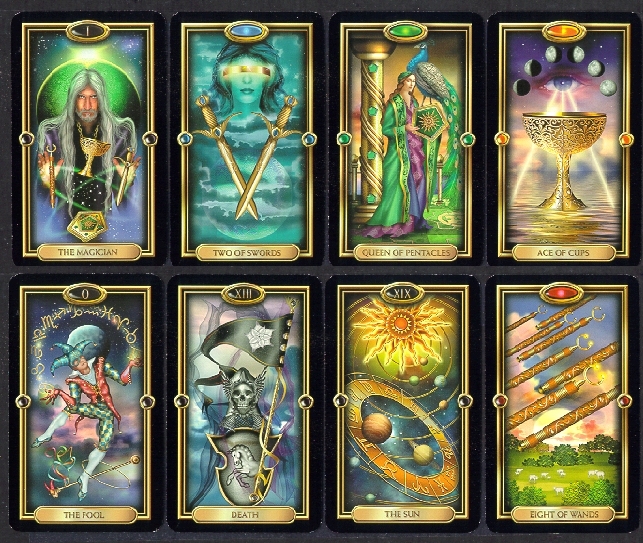 The author says there are enough details on the cards, and enough context from card to card, to provide an almost unlimited variety of meanings, if you will only make the effort. This is the version of the Gilded Tarot to get.